Most scholars agree a man of this name was a son of Cynan ap Owain Gwynedd, born c. 1165, and expelled from Meirionydd in 1202 by his nephew Hywel. A year earlier, Maredudd had been expelled from Lleyn and Eifionydd by another nephew, Llewelyn ap Iorwerth. Both Brut entries say he was driven from his territories because of his treachery. But this man lived over 100 years too late to be identified with the Maredudd ap Cynan which some sources call "a brother of Gruffudd ap Cynan". A 1633 manuscript containing pedigrees of leading families of Powys mentions a Maredudd ap Cynan who married Alison ferch Llewelyn Fychan ap Llewelyn Aurdorchog. Their grandson, called Y Llyr Craff (probably "Llawr Craff" or "very sagacious") is cited as having married a daughter of Einion ap Seisyllt. The known floruit of those ladies would seem to date this Maredudd ap Cynan to the mid-eleventh century. Furthermore, the pedigree material places the family at Meifod in Mechain and Llanfair in Caereinion; both are in central Powys, not Gwynedd. As with all medieval pedigrees, there are problems with the family chronology and with the assignments of some marriage matches with the wrong of two same-named men. But a careful analysis of the several separate citations yields six separate branches of the family in the 16th century, all traced to a patriarch who must have occurred circa 1055. Meifod was the site of an historic church, one of the most important in Powys. It is also where Sulien the Wise resided until he was elected Bishop of St David's in 1073. Sulien died in 1091 at age 80 so his appointment at Meifod would have been in the years between c. 1050/1073. Apparently the early men in the pedigree of the eleventh century Maredudd ap Cynan were clerics and indeed the Caradog ap Collwyn ap Sulien of c. 1155 is probably the Caradog who served as Archdeacon of Meifod. Not only did this Caradog name his son Sulien, but that may have also been the actual name of the earlier Y Llyr Craff. It is uncertain which Sulien actually was called Llawr Craff; the citations apply it to both Sulien the son of Maredudd ap Cynan and to the Sulien who married Alis ferch Einion ap Seisyll. In his "History of the Parish of Llanerfyl", the Rev. G. Edwards describes the ancient mansion of Nueadd Wen as the "residence of Meredydd ap Cynan, brother of Gruffydd ap Cynan, prince of North Wales". He further asserts without any source evidence that this Maredudd "served the Princes of Powys". The three lordships credited to him are Rhiwhiraeth, Coed Talog and Neuadd Wen; all were mere residences clustered about where the later town of Llanfair is now located. Rev. Edwards also refers to a nearby brook as "Nant Gwgan" and thinks Nueadd Wen was formerly named "Llys Wgan". He believes these suggest the area was once home to Cadwgan ap Bleddyn and thereby subtly links Cadwgan with Maredudd ap Cynan. We dismiss the claims of those who would make this Maredudd a brother of the Gruffudd ap Cynan who ruled Gwynedd until his death in 1137; as we argue elsewhere we believe that man was born near 1070. It is possible, however, he was a younger brother of "Gruffudd nephew of Iago" and born in Ireland about 1055. While his older brother was mostly concerned with reclaiming the kingship of Gwynedd for his family, Maredudd may have been trained as a cleric. At age 14, Maredudd might have been sent to Meifod to study under Sulien. Cloistered there, his early family would have been immune to the battles waged by his brother and by his younger cousin over such worldy matters as kingships. He may have named a son after his mentor and the name Sulien occurs several times in families descended from him. It is altogether possible Maredudd was a close friend of Cadwgan ap Bleddyn, especially if his first assignment outside the church at Meifod was as household priest (Offeiriad) to the king of Powys. Virtually the same age as Cadwgan, the latter's advancement to kingship likely occurred c. 1083/1088. That Maredudd was regarded highly in Powys can be seen from the important families from which he and his progeny took wives. Llewelyn Aurdorchog had grown up in the households of Llewelyn ap Seisyll and Cynfyn ap Gwerystan and his son, Llewelyn Fychan, was an older first cousin of Cadwgan. The marriage of Alison ferch Llewelyn Fychan to Maredudd probably occurred c. 1088. At least 3 men in the next 7 generations married ladies of the Powys Royal Family. Although Maredudd ap Cynan inheirited no lands in Wales (his father, we believe, had fled to Ireland in 1039) and was never a seeker of kingdoms on earth, the little group of houses around Llanfair was probably a grant for his sustenance...either by the church at Meifod or by Cadwgan ap Bleddyn for his service to his household. Those who deny his eleventh century existence by identifying him with a later Maredudd ap Cynan do so, we think, to debunk the claim that he was a brother of Gruffudd ap Cynan. No such brother was mentioned in "Historia Gruffudd ap Cynan" and none was cited in the Welsh annals or the Brut. We would point out that those sources were concerned with kings and bishops, not ordinary priests or teachers. And the man we identity as his brother was not the Gruffudd ap Cynan ap Iago who ruled Gwynedd until his death in 1137, but Gruffudd ap Cynan ap Idwal whose attempts to become king of Gwynedd in 1075 and 1081 did not succeed. And we suggest Maredudd was already at Meifod studying under Sulien the Wise long before his brother's efforts were noted in the annals as "Gruffudd nephew of Iago". Alison is cited as ferch Llewelyn Fychan ap Llewelyn Aurdorchog. The latter was penteulu for Gruffudd ap Llewelyn and was born c. 1005; Llewelyn Fychan was his eldest son born c. 1035. A daughter of the latter would occur c. 1065. British Museum Add. 9865, 99 cites the marriage of Alis ferch Ednyfed ap Sulien to Hywel Grach ap Owain Cyfeiliog, a man born c. 1160. Harl 1977, 268 says Gwerfyl ferch Collwyn ap Llawr Craff married Llewelyn Fychan ap Llewelyn ap Madog ap Iorwerth Fychan ap Iorwerth Goch ap Maredudd, a man of the Powys Royal Family born c. 1130. This citation calls Sulien ap Maredudd by the nickname Llawr Craff. Efa ferch Owain ap Meurig ap Pasgen ap Gwyn ap Gruffudd is cited in Montgomeryshire Collections Vol x, 20 as having married Caradog ap Collwyn ap Llyr Craff. 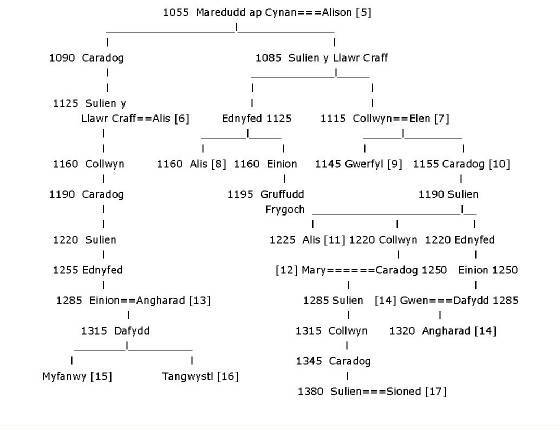 The lady was born c. 1170 so the citation again calls Sulien ap Maredudd "Llyr Craff"
 Alis ferch Sulien ap Caradog ap Collwyn is cited by Dwnn I, 305 & 317 as having married Gruffudd ap Gwen ap Gronwy ap Einion ap Seisyllt, a man born c. 1215. Pen. 138, 504/505 says Einion ap Ednyfed ap Sulien married Angharad ferch Ieuaf ap Adda Fawr ap Adda. We believe Adda was a son of Llewelyn ap Hoedliw of Is Cerdig. The lady was born c. 1300. Montgomeryshire Collections Vol x, 15 says Dafydd ap Einion ap Ednyfed ap Sulien married Gwenllian ferch Dafydd ap Gruffudd ap Ieuan ap Rhiryd ap Hywel ap Trahaearn ap Pasgen of the Powys Royal Family, a lady born c. 1300. The same citation says that Angharad ferch Dafydd ap Einion ap Ednyfed ap Sulien married Madog Fychan ap Madog ap Gwyn , a man born c. 1315 and descended from Llewelyn ap Gwrgan ap Ifor of Dyfed. Montgomeryshire Collections Vol x. 20 says Sulien ap Caradog ap Collwyn married Sioned ferch Madog ap Einion ap Hywel ap Tudor of Ceri, a lady born c. 1395. Of all the men named Sulien ap Caradog ap Collwyn, only this c. 1380 Sulien could have married Sioned. The mother of Llewelyn Fychan ap Llewelyn Aurdorchog was a daughter of Cynfyn; Bleddyn was her half-brother by another wife of Cynfyn.